It wasn’t the voice of a spiritual presence, but rather that of California Highway Patrol (CHP) Officer Kevin Briggs. The two talked for 60 life-changing minutes before Berthia decided to climb back up the bridge and give life another chance. 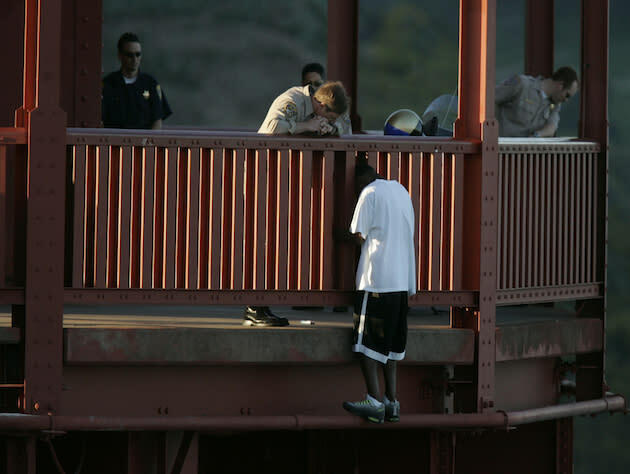 Eight years later, the pair reunited as part of an emotional ceremony honoring Briggs and other members of the CHP whose job is to verbally persuade suicidal men and women from jumping off that bridge. 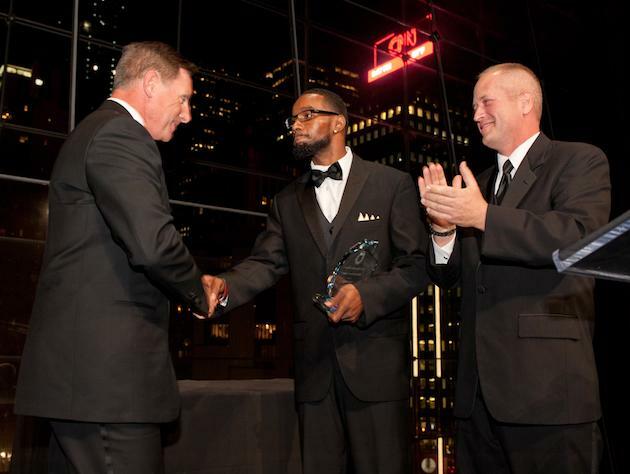 “It was phenomenal,” Berthia, 30, told Yahoo News about his reunion with Briggs at the American Foundation for Suicide Prevention public service ceremony. In the eight years since their first meeting, Berthia has dramatically turned his life around. He still resides in the Bay Area, home to his darkest of memories, but he has now built a new life for himself, with a successful marriage and two children. He says the time Briggs spent just listening to him forged a connection that helped put him on a path of mental recovery. Over the years, it didn’t seem likely the two men would ever see each other in person again. But in December 2012, Briggs took part in a Yahoo documentary video that chronicled his work on the suicide prevention beat. The story centered on Berthia’s incident while retaining his anonymity. But the footage included an emotionally striking photo of Berthia with his back to the camera and head hung low against the bridge while Briggs attempted to console him. The outpouring of positive responses to the video provided a catalyst for the reunion. After an initial meeting between Briggs and Berthia’s mother, the two men and their families met privately in a small room before the ceremony began. Things truly came full circle when the two men took the stage and Berthia introduced Briggs to the audience. Much of the attention was understandably given to Berthia and his courage in agreeing to speak publicly about his personal experience. But after his introduction, it was Briggs who found himself overcome with emotion and needing to lean on the young man whose life he had helped save. After the awards ceremony, Briggs and Berthia said they made plans to stay in touch. In fact, Berthia and his family plan to attend a Christmas party with Briggs later this year.